Moments and places captured on journeys into the Eastern Sierras, and spending time from Bridgeport, south to Lone Pine. I have birded and photographed the varied environments. Here are some landscapes, wildlife and wildflowers from these travels. 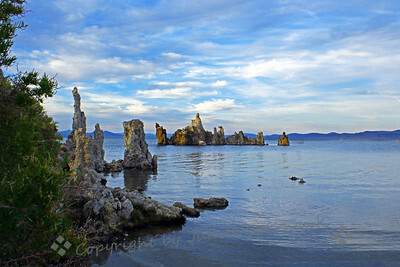 Mono Lake Tufa Towers ~ Although it was getting late in the day, the sun was still up, and the sunset colors were still to come. Sierra Sunrise and Moonset ~ While birding up at Division Creek above Aberdeen, the sun rose in the east, painting the gray Sierra peaks with a rosy glow. 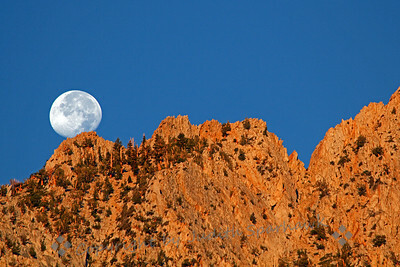 At the same time, the almost-full moon was setting over the peaks. It was a magical moment. 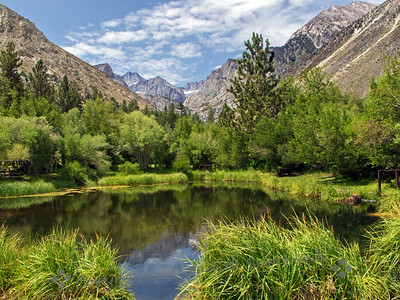 Virginia Lakes ~ This beautiful spot was just a few (steep) miles off Hwy 395, a little north of Lee Vining. We saw Cassin's Finches and Gray-crowned Rosy Finches at the feeders, as well as many Belding Ground Squirrels. This photograph was at about 6:30 am, with the lake mirror-like. A Northern Goshawk flew through the forest here. Moonset at the Arch ~ After the storms finally blew through, clear skies at dawn let the moon show through to moonset. 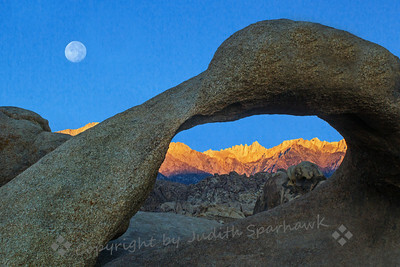 I had gone out to Mobius Arch (again), hoping for the dawn's light glowing from the east onto the Sierras, and for the moon to be thrown in for good measure. Success! 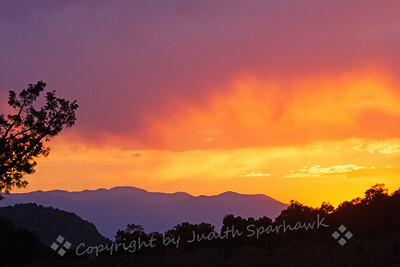 Purple Sunset at Grandview ~ While camping at Grandview Campground, a few miles from the Bristlecone Pines in the White Mountains, the sky had become increasingly cloudy, and I almost gave up on a sunset. Miraculously, when the time came, these glorious colors painted the western sky, becoming brighter and brighter, changing hues, and entertained me well for close to an hour!. ~ I knew there was supposed to be an almost-full moon that night, but the cloud cover was pretty thick, so I didn't know if I would see it at all. Finally it showed itself, came up through the clouds, and made its appearance for about a minute or two before it again slipped behind the clouds. 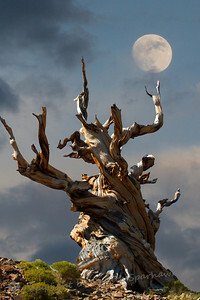 ~ Visiting the Bristlecone Pine National Park in the White Mountains, east of the Sierras, I photographed many of the old gnarled trees. 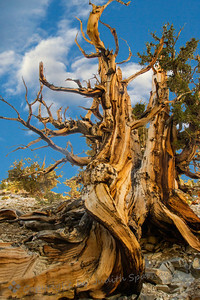 Some of the trees in this park are up to 4000 years old or more, and are amazing in that they can live and grow (slowly) at over 10,000 feet elevation, in poor soil and under harsh weather conditions. 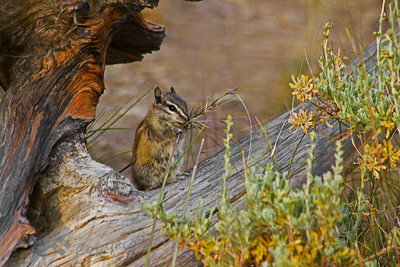 ~ Outside the Visitor's Center at the Bristlecone Pines, many of these tiny Least Chipmunks were jumping around and eating grass seeds. This one sat still long enough for 2 or 3 quick shots. 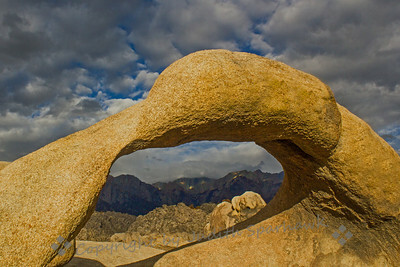 Mobius Arch ~ The arch in the Alabama Hills looks bright agains a stormy sky. Sure enough, the coming storm dropped a heavy rain on the area that night, washing ruts in the dirt roads and perfuming the air with a glorious scent of the desert rain. 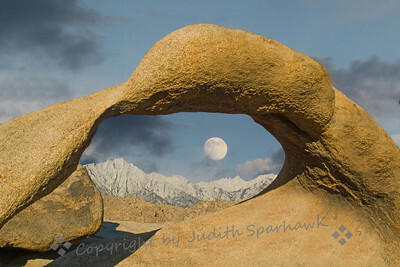 Moon Through the Arch ~ The famous Mobius Arch in the Alabama Hills, made famous by photographer Galen Rowell and other Sierra photograpers. 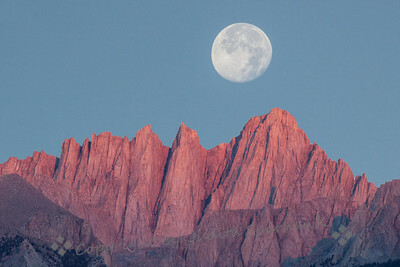 By the time the moon was setting on this day, the rosy glow of dawn was gone, and the Sierras had taken on their light gray color. Mount Whitney at Sunrise/Moonset ~ After getting rained out at the Bristlecone Pines, I escaped to the Alabama Hills, out of Lone Pine, California. The sharp Sierra peaks oversee this area. At dawn, before the sun actually rises above the eastern mountains, the higher peaks in the west take on this rosy glow from the coming sun. This almost-full moon was setting above these peaks. 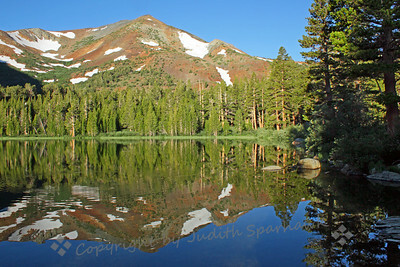 Glacier Lodge Pond ~ Out of Big Pine, California, up a steep, curvy road, Glacier Lodge is a great stop for birding and photography, camping, hiking. This trout pond reflects the sheer glacier-formed cliffs. 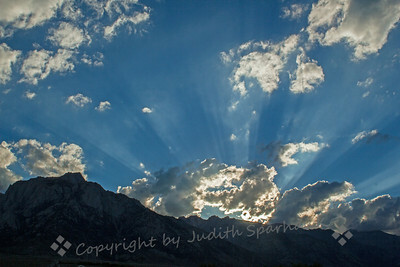 God Light Over the Sierras ~ Just returned from a July trip to the Eastern Sierra. Despite two terrific thunderstorms, I greatly enjoyed shooting the resulting cloudy skies. This view was not long before sunset over the Sierra peaks, from the Alabama Hills out of Lone Pine, California. 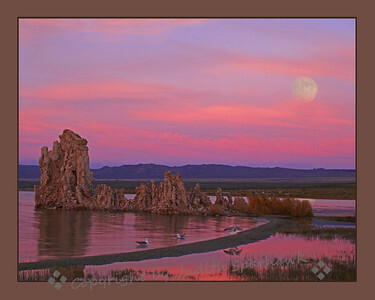 Full Moon Over Mono Lake ~ After the sun set, the colors deepened and became wonderful oranges and pinks. Seeing the full moon hovering in the colorful sky, was a magical moment. The California Gulls bathed in all that glorious color. 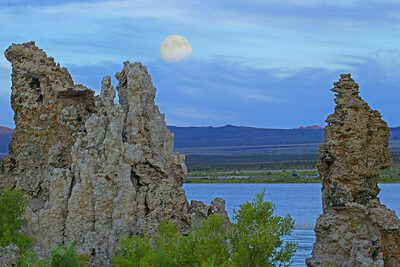 Moonrise Over Mono Lake ~ I had been waiting and waiting for the full moon to rise, and suddenly saw it coming up from behind the clouds on the horizon. The colors were quiet blues, soon to become wild oranges and pinks from the setting sun. 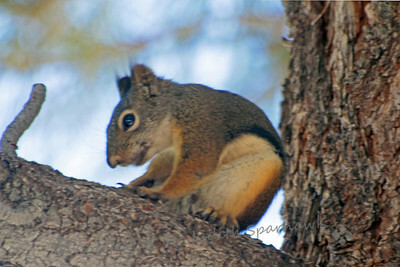 Douglas Squirrel ~ This squirrel, also called a Chickaree, has ear tufts and very big eyes. This photograph doesn't show its bushy gray tail. The name Chicaree comes from its loud call. 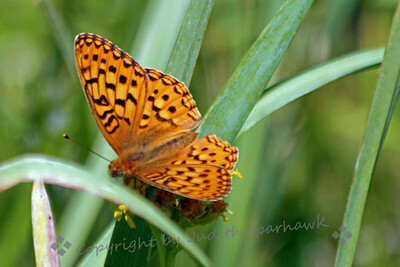 Yuba Fritillary ~ This pretty butterfly was probably the most common one I saw in the Sierras this August. Peeking Marmot ~ This female Yellow-bellied Marmot had hidden below the rocks when I hiked into view. 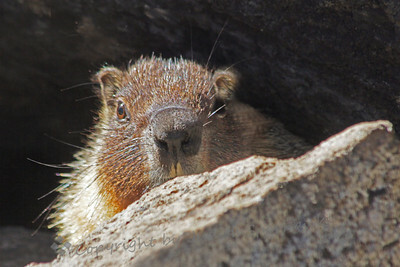 She then peeked up over the top of the rock near her burrow. As she saw I meant no harm, she came out and posed quite nicely. She was at Bridal Veil Creek Campground in Yosemite. 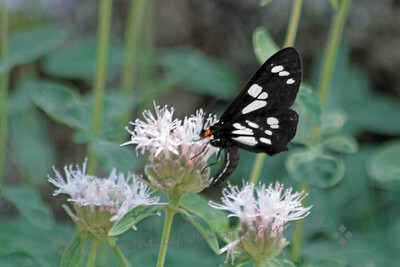 ~ This pretty little moth fluttered about various flowers during the daytime in mountain meadows and forests in Yosemite National Park. I liked its striking black and white markings, and the orange spots by the head. 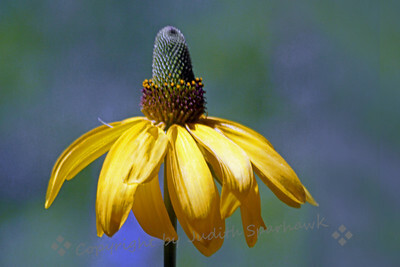 California Cone Flower ~ I found this wildflower at Chevron Meadow in Yosemite National Park. 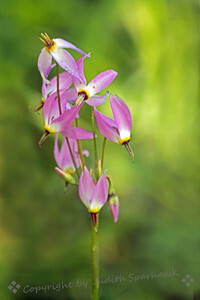 ~ These fairly large shooting stars grow in mountain meadows at 6000 feet or below. These were in Yosemite, and there were masses of them in some of the meadows.